Mark Lees crowned 2018 National Match Racing Champion in thrilling final as new season kicks off at Queen Mary SC. 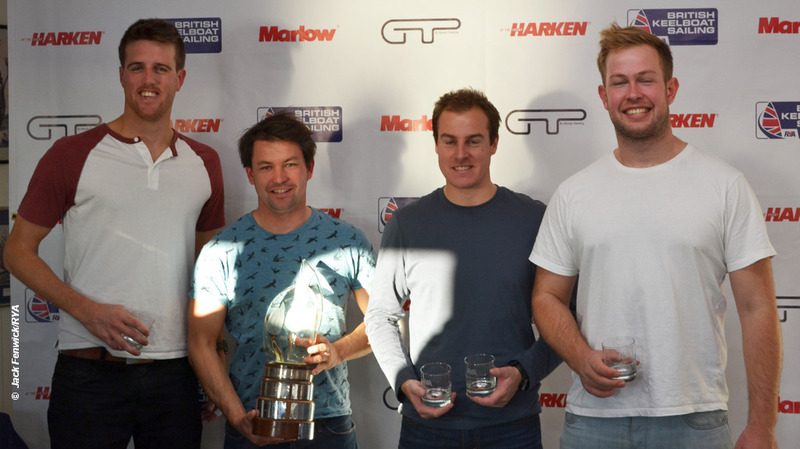 Lees, sailing with Toby Mumford, Toby Yeabsley and Tom Forrester-Coles, took the National Championship crown for the first time following a nail-biting contest at Queen Mary SC with a five-way tie at the end of the round robin. Christian Hamilton led Lees on a tie break with Tarra Gill-Taylor in third, Matt Whitfield fourth and Nicholas Wilkinson fifth. Hamilton, Lees, Gill Taylor and Whitfield all swept their Quarter Final matches 2-0 to take their places in the Semi-finals. Hamilton beat Whitfield 3-0 to progress to the final while Lees had a tougher battle against Gill-Taylor, slipping behind 2-1 before coming back to win 3-2. Buoyed by that victory, Lees was decisive in beating Hamilton 2-0 to seal victory in the final. The new and expanded RYA match racing season is already underway with an increased number of opportunities for sailors of all levels to get involved and entries now open for the 2019 Championship. Entries are now open for the 2019 National Match Racing Championship with an increased number of opportunities to take part on offer. Three open winter match racing events will be taking place at Weymouth and Portland National Sailing Academy in January, February and March and a women’s winter match racing event has been added to the programme in March to meet an increased demand from female sailors. 2019 will also see the National Match Racing Championship move to the Royal Corinthian Yacht Club in Burnham racing in the club’s new fleet of 707s.